As car 26 rolled toward the entrance of Muni’s cable car barn, a sense of melancholy gripped the few dozen people who turned out. You may not know the name of Efren Bernal. But his work is on rolling display in San Francisco’s streets every day. Bernal began working for Muni as a cable car painter in 1983, a job he’s held ever since. His intricately detailed designs and handmade silk screen graphics adorn nearly all 40 of San Francisco’s rolling wooden ambassadors. Harris said Bernal, 62, was an artist where others were simply painters. 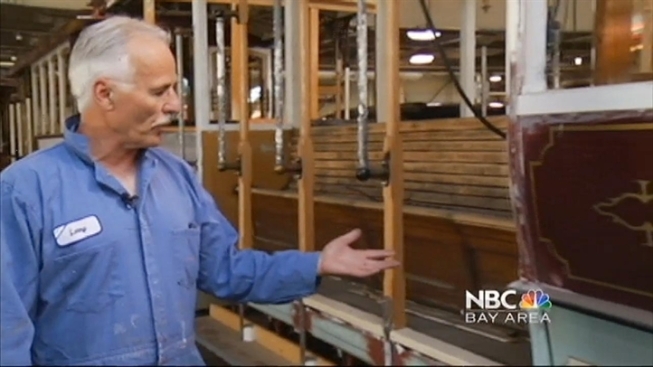 He crafted the silk screen graphics that gave the cable cars their old world detail and logos. Harris said Bernal poured over every detail. On Wednesday, Muni unveiled cable car No. 26, an 1890-era cable car, recently repainted in a green-and-white 1947 paint scheme. That’s the year the city’s mayor proposed replacing the Powell Street cable car line with buses. The city’s voters rejected that idea. As Car 26 rolled toward the entrance of Muni’s cable car barn, a sense of melancholy gripped the few dozen people who turned out. It turned-out, Car 26 would be Bernal’s last paint job. In March, Bernal was diagnosed with cancer. His family said the illness had spread and was now at stage four. Bernal’s family attended the launch of car 26, which was dedicated in his honor. His daughter said Bernal devoted his life to the cable cars, something he revealed during recent conversations. “He said it’s just being a part of the historic, the beautification of San Francisco,” said daughter Mariel Bernal Perales. “Being a part of that meant a whole lot to him.” Workers wondered if the loss of Bernal marked the end of an era for the cable cars since he was the one who made the intricate silk screens, and possessed the artistic skills to paint fine designs. “I’m not sure we’re going to get too many people who are going to come here and do this kind of work again ever,” said Harris. Bernal’s daughter wondered if car 26 marked the end of an old way of craftsmanship. “This was the last cable car he worked on,” Perales said. “And it just may be the last hand painted cable car.” Harris said he and other workers wanted Muni to name the car after Bernal. Then he paused and gestured toward the dozens of cars filling the barn. “Any one of these cars that he’s worked on - that’s made it shine - deserves his name,” Harris said. Following a ribbon cutting, car 26 began to lumber out of the barn and onto the tracks. The sunlight caught the golden number 26, scattering a spark of beaming light. On board, Bernal’s family held on tight as the grip man pulled the lever and the car began its slow journey. Bernal’s daughter beamed with a bittersweet pride.